Whenever we mention to people that we like to go out and shoot archery and throw axes, knives and spears, we get a lot of “That’s cool! How can I do that?” Well, here is your bi-monthly chance to join us at the Barony of Altavia’s twice monthly practice sessions at the Woodley Park Archery range. Everyone is welcome. We don’t “dress up” for practice (At larger official SCA events we dress in “garb” or period attire) If you want to throw axes and knives you must be wearing closed toe shows. We have some loaner archery gear for you to use, too. Repeats: This event repeats every month on the third Sunday. Notes: Join Altavia’s Captain of Archers James Everglad and Thrown Weapons Marshal Lady Cecilia Medici for Archery and Thrown Weapons practice at Woodley Park. Event: Annular eclipse Sunday partial View in Los Angeles- just before sunset! My new custom made arrows! Update (April 28, 2011): I am happy to report that the arrows fly beautifully. They are probably better than my current skill level can actually utilize, but I hope to grow into them over the next several months. I spent almost 2 hours today shooting from all different distances and look forward to shooting them a lot more. This weekend is my first SCA tournament, (Robin Hood Archery, Rapier, and Thrown Weapons Tournament) and my son, Joe’s second. I hope these arrows “up my game” and help me do well. I don’t see how they can fail in that regard. Custom Made Arrows, originally uploaded by dewelch. 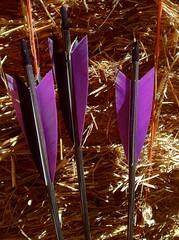 These were made by Guy Taylor/Greenman Archery in Anaheim, California on recommendation from some fellow SCA members. Click the link above for more information on Guy and his work. Guy was great at leading me, a true archery novice, through all the options on custom made arrows including length, weight, type of bow I was using, left-handed vs. right-handed, and aesthetic considerations like color, shape of fletching, etc. I think these turned out beautifully and can’t wait to get out and shoot them. I have a practice on Wednesday night and then my first SCA tournament, along with my son, Joe, on Saturday. I went with purple and black for a variety of reasons. One, I wanted to choose a color that other archers didn’t have, to make it easier for scoring. I always like the combination of purple and black so that idea just jumped to mind. 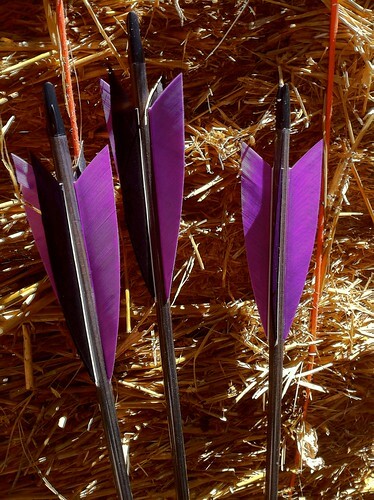 I’ll post more info here once I have had a chance to put the arrows through their paces. Based on the experience of those who recommended Guy, though, I am sure I will be very pleased.